Technology has transformed the way guests book their hotel rooms. The hotel industry has been a leader in the evolving digital landscape. Today, hotel bookings make up 15 percent of all U.S. ecommerce, with 500 online bookings happening every minute. Throughout this transformation, the hotel industry continues to put our guests first to ensure they get what they want and need out of their reservation. 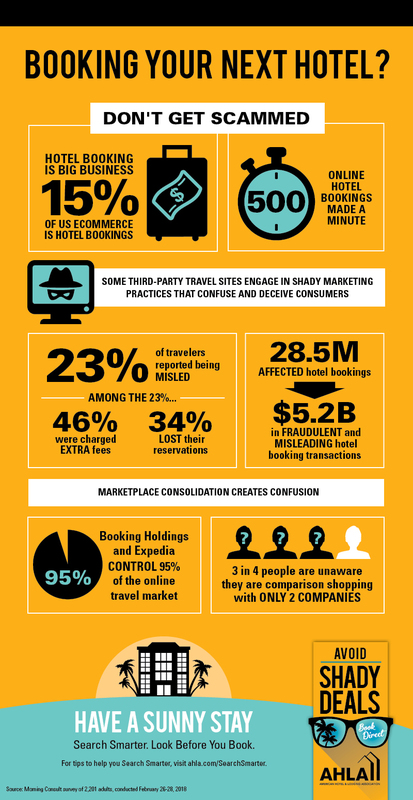 Unfortunately, new research from AHLA suggests that online booking scams and fraudulent and misleading travel websites continue to mislead and confuse consumers. That’s why AHLA is encouraging consumers to Avoid Shady Deals and Have a Sunny Stay by searching smarter for their hotel stays. Avoid Shady Deals. Look Before You Book! Look before you book. Some of these booking sites will go so far as to use the hotel’s brand name in the URL. Take an extra minute to make sure you’re on the real hotel’s booking site. Always check the URL address. Although the hotel name may be part of the URL, double check the website address to ensure it’s not a third-party vendor using a hotel’s identity without permission. Make sure you know who you’re giving your information to. Take advantage of loyalty programs. Sign up for loyalty programs at your favorite hotels. They’re free and offer amazing benefits – and they’re only getting better, as hotels continue to introduce new perks to their programs. Always book directly with the hotel to make sure you’re getting your points. Book directly with the hotel or a trusted travel agent. This can help ensure you get what you want and need from your reservation and often provides the better value. Have you been scammed or deceived when you booked a hotel reservation? File a complaint here. New research suggests that online hotel booking scams and fraudulent and misleading marketing practices are an ongoing and widespread problem. Consumers are being misled into making hotel reservations through fraudulent and misleading websites and call centers operated by third-party affiliates of online booking agencies – giving the false appearance of being affiliated with the hotel. With 500 hotel bookings happening online every minute, it’s more important than ever that consumers pay close attention when booking reservations online. Consumers want more transparency in the online booking process, as well as greater protection from the government. That’s why AHLA is asking Congress to pass the Stop Online Booking Scams Act, a bill that would protect consumers by increasing the transparency and security of the online booking process. In the meantime, AHLA encourages consumers to book directly through the hotel website or mobile app, or through a trusted travel agent. In addition to helping consumers avoid scams, direct booking often results in the best deal and more travel perks and benefits. AHLA is a national partner of the Better Business Bureau (BBB), which offers a tips page to educate consumers on how to avoid costly and painful scams when booking hotels online.